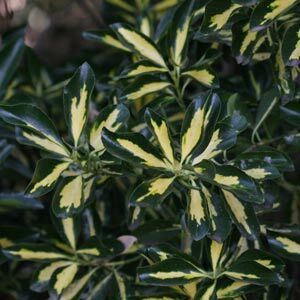 Euonymus japonicus – Low growing to medium shrubs with variegated foliage, glossy foliage and can be used as a feature in the border or as a hedging plant. E. japonicus Mediopictus has outstanding foliage. Euonymus compactus – Should be called E. alataus compactus, a low growing shrub with brilliant autumn foliage. Will reach around 2m, easily pruned to a smaller size. Euonymus alatus – Sometimes called the ‘Burning Bush’ Brilliant crimson foliage in autumn on a small tree. Suited to smaller gardens and could be grown in a container. Very hardy in full sun and withstands dry conditions well.